The Suspect Device Blog drops the bomb on compassionless conservatives with the post, "We've worn out our welcome." I concur with every word. How can this be? But political talking head Bay Buchanan said on CNN the other day, "I think Katrina has worn its welcome... the American people are tired of it." The levees are not quite repaired back to even their pre-Katrina level. With the exception of temporary gates at the three outfall canals, no real improvements to the hurricane protection system have been made. If another Katrina comes this year, it will be deja vu all over again. Plaquemines: washed away. St. Bernard: a giant bathtub. New Orleans East: running water in every building. The only thing that will be different is that there will be fewer people to drown. It was a bright and breezy day in Buras, Louisiana. Deep in the heart of Plaquemines Parish, the long, thin community that follows the Mississippi River from just south of New Orleans to where it empties into the Gulf of Mexico, I visited Louisiana’s own “Ground Zero” this week. The cool, sunny weather made it difficult to imagine what had transpired at this location nine months ago. The very eye of the largest, most destructive hurricane in recorded history made landfall here, delivering devastation in multiple punches. First, Hurricane Katrina pushed her massive storm surge into the parish, spilling over the levees and punching through several floodwalls. Then, she lashed at the buildings and towers of the parish, knocking the Buras water tower to the ground and scattering the splintered debris of homes for miles. 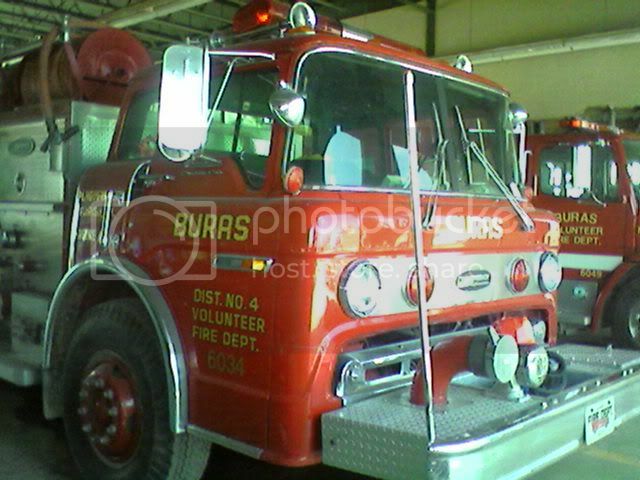 In the center of Buras, one of the few remaining landmarks that I recognize is the Buras Fire Station. A simple utilitarian steel framed building, the industrial-sized roll-up doors on both ends of the building are gone. 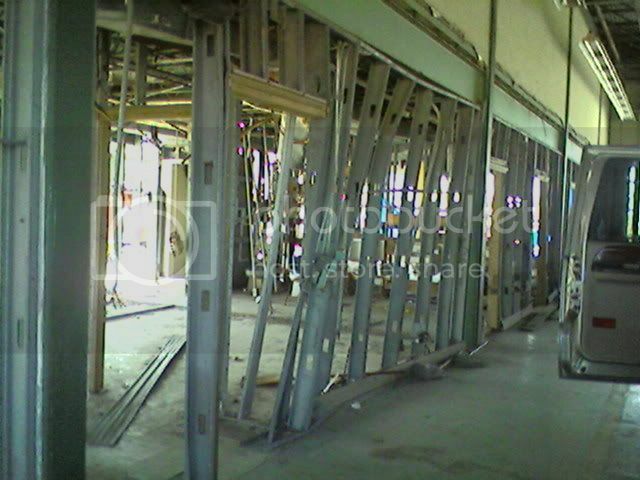 All that remains of the building’s interior is the light gauge steel framing that used to provide walls between the rooms. Amazingly, four fire trucks stand ready under the badly damaged roof--this is still an active fire house. A local citizen tells me the all-volunteer Buras Fire Department continues to protect what remains of their community. Most of their calls come at night, I am told. The trucks are not as shiny and pretty as is typical of fire equipment, but no one is going to begrudge the volunteers if their trucks are not as polished as they used to be. We all have realigned priorities since Katrina. 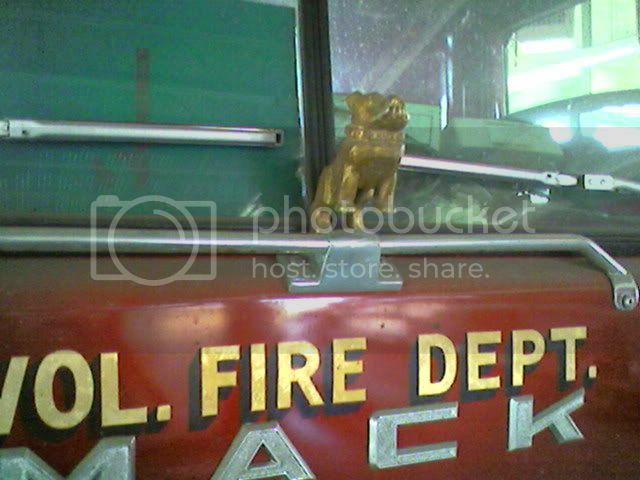 I am intrigued by the bulldog hood ornament on one of their Mack trucks. Bulldogs were bred to fight, and are known to be stubborn animals. I wonder if the Buras volunteer firefighters ever considered adopting a mascot, because the bulldog would be ideal. Betsy, Camille, Katrina and Rita all left their marks here. These hurricanes (and certainly more in the future) challenge the people of Buras. But they hold on, they persevere, and they thrive. No one—not Old Man River, not the U.S. government, not even the hurricanes of a dozen names—will push these stout citizens off their chosen home lands. Even as another hurricane season approaches, even as the Corps of Engineers hurries to complete repair of levees and floodwalls, people are returning and rebuilding. Stubborn is the only word for it. And as I stood in the practically destroyed Buras Fire Station, I was reminded again of the spirit that makes this nation great. I marveled at the sheer audacity of the Buras Volunteer Fire Department to continue to operate from here, to show their friends and neighbors that although buildings and towers can be toppled by hurricanes, communities can stand tall. Hurricane Katrina had passed directly over Buras, delivering the horrible force of a tropical cyclone in record measure. But it was clear to me that as Katrina tore through their community, the good people of Buras spit in her eye. They looked into the eye of Hurricane Katrina, and did not blink. My job took me to lower Plaquemines Parish this week, down a slim finger of developed land on the west bank of the Mississippi River. We drove down Louisiana Highway 23, the single route that will take you all the way to the end of the state, as close as you can get in a car to where the river meets the Gulf of Mexico. 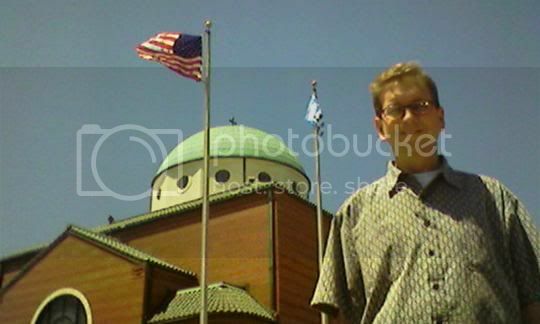 With me was Ken Dugas, Parish Engineer. The sky was clear, the sun bright, the grass and trees full of life. So every few miles, Ken reminded us of the destruction, the death and flooding that had visited upon the people of Plaquemines almost eight months ago. I had not visited this part of the world much prior to now, so except where I saw piles of debris along the road, I did not know the extent of the damage. "See those slabs down that street?" Ken would point out, "There used to be 6 or 8 houses there. When the water came through, they were all pushed up against the trees in the back." 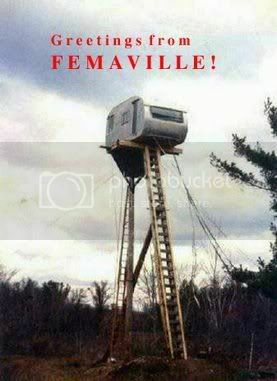 I saw lots of FEMA travel trailers. I'm used to seeing them in the heavily damaged areas of New Orleans, parked in front of or next to the gutted houses. Except down there, it was just trailers. I began to realize that the houses were gone--washed or blown away. The violence visited upon Plaquemines far surpassed what we experienced here. As we drove south, we saw the Mississippi River levee on the left, a long pile of dirt that holds the river in its banks and also keeps hurricane storm surges in check. On the right side, sometimes off in the distance, but sometimes near, is another levee, the "back" levee, that keeps the marsh water, lakes and gulf water at bay. At least that's the way it works during most hurricanes. In the early hours of August 29, 2005, the eye of Hurricane Katrina passed over Buras, one of the small bergs along the highway. The counter-clockwise rotation of powerful winds and Katrina's record-breaking storm surge resulted in near total destruction of lower Plaquemines. Wind and debris shredded houses and knocked down radio and cell phone towers. Water rolled up and over both levees: south of Buras, the water rushed over the back levees, while to the north, the Mississippi River flowed unabated into thousands of homes and businesses. Ken worked through Katrina and has hardly stopped since. He rode an airboat to rescue people, distributed food and water, and worked to get the roads cleared and the water pumped out. "Over here, we found a dead horse up in a tree," he states matter-of-factly. "See that blue building? That used to be a doctor's office." The building leans heavily to one side, its walls cracked and bent beyond repair. "It used to sit over by those stairs," he notes, pointing at a handicap ramp and steps at least 50 yards away. Another parish employee told me how he worked during the hurricane. Angelo (I did not get his last name) supervises the operation of the many pumping stations along the slender stripe of inhabited parish. As Katrina approached, Angelo was manning the southern-most station in the system--in the town of Venice, where the boats outnumber the houses. When wind and tide began to threaten dangerously, Angelo headed north, stopping at each station along the way to dismiss the other pump operators and secure the buildings. He and his men rode out the worst of the storm in Belle Chasse. For several days, flooding prevented his crew from getting back to their stations. With the many large holes in the levee system, it would have made no difference to run the pumps anyway. But once the breaches were plugged and boats and provisions became available, Angelo and his operators returned to work and began to pump lower Plaquemines dry. For many days they lived at the pump stations, ate MREs and worked to keep the intakes clear of debris and the pumps turning. After two weeks, most of Plaquemines Parish was dry. It was right about then Hurricane Rita passed to the west of Plaquemines Parish. When the hastily repaired levees did not hold, they had to pump the parish out all over again. There's been all kinds of news coverage of New Orleans, and folks in Mississippi have been well compensated for the beating they took from Katrina when that monster came up on their beaches. But the good people of Plaquemines suffer silently and almost unnoticed. They were pelted by the peak winds of Katrina and washed in water from both the salty gulf and the muddy river. As they struggled to recover from one fight, they took another beating from Rita. These are the kind of people that build nations. The kind of people who will bury their dead, sweep out their homes (if still there) and go back to work the next day. Ken and Angelo are just two of the amazingly dedicated, hard-working public servants I met. They did what they did not for fame and glory, not for prestige or money. They did it because it was their job. Period. To them and to all others like them, I say, thanks for a job well done. Saturday’s election in New Orleans had barely finished when the major media began to characterize it as a race about race. Nothing could be further from the truth. Here’s what one New Orleans blogger has to say about that: baloney! Ray Nagin became our mayor not because a whole lot of black people voted for him; he won the job because a whole lot of white people supported his fresh, business-like approach to public office. And Mitch Landrieu, rather than playing the part of the Great White Hope, actually has a reputation of support across racial lines. Both men play to the middle. Forget Nagin’s ramblings about Chocolate City. That’s about as racist as Ross Perot’s comment about “you people” while speaking to the NAACP. Never forget that New Orleans is a port city. And like every other major port, our city has been influenced by the absorption of many different people from many different lands. Sure we’ve got a French Quarter, but we also have an Irish Channel and Gert Town, and we have an Italian Parade and a large Vietnamese community, too. And at all these locations, Americans, black and white, were working, eating, living and playing together. So let’s just cut this race-based Mayor’s race nonsense right now. We need a mayor who can lead the city into rebirth--not just one ethnic group of citizens, not just certain parts of the population--all of us. I would thank the media to put aside the profit motive for just this once. Adversity has a way of bringing out the best in people, and bringing them together in the process. In my tree-lined neighborhood of Vista Park, many of us knew each other. We've had annual New Year's Eve block parties since 1999, and we've had an annual pumpkin-carving party every Halloween for as long as we've lived there. But the neighborhood I experienced so fully only extended about two blocks. People around the corner or two streets over were utter strangers. Since Hurricane Katrina cast all our fates together, we've all been reaching out in every direction. I most strongly identify with Vista Park, but we are just one small grid of streets in the much larger subdivision known as Gentilly. Some call it, "Chilly Gentilly." No explanation necessary. In the awful days immediately following the flood, we scrambled to find our friends and neighbors. Scattered like stars in the sky, we struggled to reconnect and rejoin. Cell phones failed us big time. The U.S. Mail, so proud of their motto, took an extended leave of absence. Only the Internet worked for us. For the first few days, my Darling Wife and I made daily visits to local public libraries where we were evacuated to keep in touch. Soon we were getting news and information from a variety of Yahoo! Groups, like one for my Precious Daughter's school, and others for Vista Park and Gentilly. Nearly eight months later, I know more about more neighbors than ever before. We exchange news and ideas, debate politics and cry on each others' shoulders via keyboard. I truly cannot imagine what we would be doing without the grounding of open communication via the Internet. For me, these Yahoo! Groups are 21st century Support! Groups. But it can be fun, too. Some clever wag on the Gentilly Civic Improvement Association group recently penned this little gem about the latest on Base Flood Elevations (BFEs). Lucky for us, no matter how stressed we are, we keep our collective chins up and we remember to laugh. "I have spent the last day and a half researching the new building requirements and advisories from FEMA, the City, LRA, SBA and, as yet to be named, TBA. I think I finally understand. Please note: If the first letter of your last name is in the first half of the alphabet, these rules do not apply to you. (1) You are not allowed to rebuild/renovate in any month ending with the letter "Y" unless you raise your home precisely 34 1/2 inches above the height of the meat counter at Robert's Market. "Y" months are OK for anyone going higher than the highest wine rack at Meme's. (2) When you do rebuild/renovate, your front door must face an equal distance between the 17th Street Canal breech and the old Pontchartrain Beach. If you do not comply with this requirement, NFIP will "Wild Mouse" your flood insurance rates. (4) Finally, in order to get a building permit and keep your current insurance rates you MUST have proof of ownership of a FLOATIE for every member of your household. I hope this has helped." I laughed out loud when I first read it. So yes, it did help. A lot. 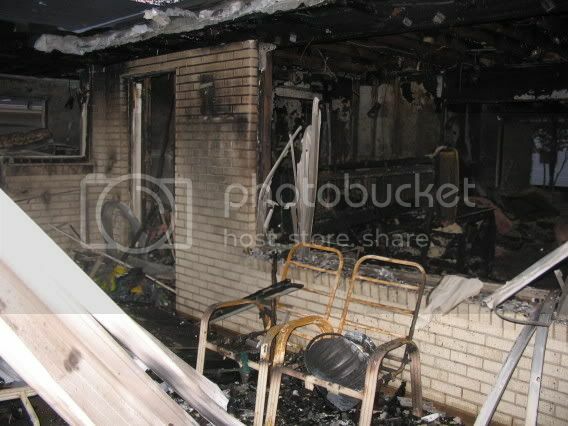 Okay, so the house is burnt. Before that, it was drowned. But it ain't over yet. Several bloggers complimented me on my calm, level-headed demeanor. I mean, what the hell else can I do? If crying and screaming could make it all better, I'd be bawling like a Saints fan after losing yet another game in the last two minutes. But as the great philosophers Page and Plant tell us, "Cryin' won't help you, prayin' won't do you no good." As the news of our Tuesday morning fire spread, several people (bloggers, co-workers, friends and family apparently all think alike) were quick to point out that we might be able to make a new claim on our homeowners insurance. Some suggested this fire could turn out to be a good thing! Well, that remains to be seen. Yes, our insurance is still in place, but I don't know all the details about what may or may not be covered, or even by how much. It's one of the lessons thoroughly driven home in post-Katrina New Orleans and all along the hurricane-ravaged Gulf Coast: you think you know what insurance you have, but you don't really know until you file a claim. I could probably give a seminar on the topic, "The Large Print Giveth, but the Small Print Taketh Away." Sometimes these little details amounted to a few dollars, sometimes thousands. Sometimes the minutia of insurance works to your favor--yes, it happens--but most often not. My Darling Wife and I discussed this Tuesday afternoon. I thought it would be strange to put in a claim for damage to an already ruined house that we plan to knock down anyway. She correctly pointed out that the structure still has value, and that until we actually carry out the demolition it retains that value. I finally just said, "Call it in and see what they say." On Wednesday, an insurance representative called me to get our claim moving. He asked me for some ordinary facts and information, and then he asked if he could record a statement. Sure, why not? The taped interview began with a recap of the same ordinary facts and information, but then he asked me, "What time did you leave your house on Monday morning?" I reminded him that the fire was on Tuesday morning. "Yes, I know, but I'm asking about Monday." Uh oh. With a tinge of dread I began to realize where this was going. Goosebumps rolled over my body like a cold tide. Successive questions confirmed my fear. "Did you go directly to work, or did you make any stops along the way? Do you work in an office? Did you remain at work all day? What time did you leave work on Monday? Did you go directly home? Did you go anywhere Monday evening? What time did you leave your house on Tuesday? Did you make any stops on Tuesday morning, or did you go directly to work?" Yes, it turns out that I am a SUSPECT. Think about that for a minute. We've all heard stories about people who torch their own failing businesses or financially cumbersome houses just to collect the insurance. It's just so logical that when someone is hurting for money and there is a suspicious fire, the owner is the most natural SUSPECT. Emotionally, I am furious. I am embarrassed and I feel abused. Suddenly, my trustworthiness is called into question. Suddenly, my honor must be investigated. I know this is just routine. I know it's not personal. I know that it will amount to nothing because I had nothing to do with the fire. But to be asked, point blank, by my own insurance company, "Did you go directly home?" is indescribably rude. I had to remind myself of the foster children we had about ten years ago. We had two little girls, sisters, staying with us, and one afternoon, the youngest complained about her elbow hurting. After trying everything we could, we finally had to take her to the emergency room to get it looked at. The diagnosis was nursemaid elbow, a common injury that was easily treated. But then we had to fill out a report for the Department of Social Services. The social worker conducted a detailed interview to determine what happened, and to see if we were being abusive. I remember being a bit insulted at the time, but it amounted to nothing since both girls admitted they had been rough-housing at the time of the injury. And the social worker was just doing his job. No harm, no foul, right? Still, it is strange and unpleasant to think that I am now a SUSPECT. A little after noon today, my Darling Wife called me with these frantic words. She had gone to the house to check on the plumber's work. Our comfortable house in Vista Park on the north end of New Orleans is scheduled for termination, probably early next month. We plan to live on site in a FEMA travel trailer while we rebuild, so we hired a plumber to make the sewer and water connections available to us even after the house is knocked down and carted away. 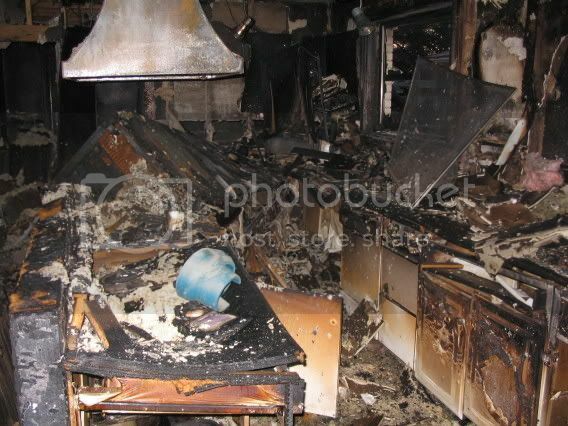 "It's all black and burned and the patio cover is down," she said. I listened breathlessly as she walked around the property, describing what she was seeing. "It's black. The kitchen's black, the sofa is just black springs..."
A neighbor down the street had gone outside early to enjoy the morning air. It's been getting up to near 90 for the past few days, so mornings are the best time to be outside. She saw the smoke and called 911. It was about 7 am. Four fire trucks responded. They quickly had the fire under control, but as firefighters are trained to do, they tore out walls and ceilings to make sure it was all thoroughly doused. And they broke all the windows. My Darling Wife was very upset by the sight. I had to remind her that the house was, well, dead already. What difference did it make? She was upset that there could be a fire at our house, our home, and we did not even know about it. She also wondered who would do this. Who started this fire? I gave her the phone number to the Fire Department and asked her to call and ask for details. She called me back a little while later, a little calmer, but still upset. The Fire Department told her an investigation had been started, and that we would receive a copy of the report in two weeks or so. The neighbor who called it in told my Darling Wife that the firefighters on the scene said it probably started in the attic. We don't know how any fire might get started on its own in our house, especially since the electricity and gas have been disconnected. We can only speculate that a vagrant or vagrants of some sort were there and caused a fire. Was it an accident? We may never know. I went to see for myself this evening and took these photos. It's hard to believe that after so much destruction there could be more destruction, but there it is. The incident drove home a worry we all have in post-K New Orleans. That thousands of empty, rotting houses remain standing in row after row of flooded neighborhoods. That those houses are easy refuge for vagrants, criminals and delinquents. That a careless or deliberate fire could erupt from any of them at any time. The good news here is that the New Orleans Fire Department responded quickly and effectively. I did not see it, but our neighbor said they did a fabulous job all around. When we do return to our still sparsely-populated street, at least I know that someone will come if we ever have to dial 911. In the end, no one was hurt, and we had already taken everything we could salvage, so it's hard to say we suffered any damage. 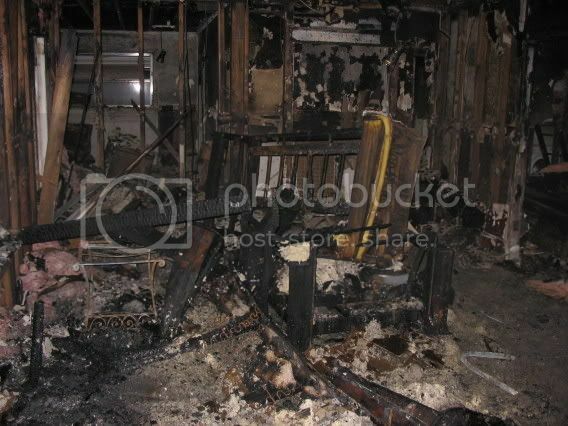 I've often said our house is "toast;" I just didn't mean it so literally. To think that just yesterday I was blogging about how good things were going in spite of the beating we took from Katrina! I like to call the part of New Orleans where I live the "sliver by the river." That's where most of what remains inhabitable after Katrina is--hugging the river. I've also heard it called the "Isle of Denial," but let's not go there. Some good news today. SBA, the Small Business Administration, has approved me for a low-interest loan. Now mind you, I am not a small business, and neither is my family, but in the bureaucracy of the United States Government which I lack sufficient brain power to comprehend, individuals who are victims of properly declared natural disasters can get personal loans to rebuild and replace their homes and possessions. So the nice SBA loan officer informed me that we will be offered a loan at the special post-K rate of 2.687 percent. Compare that to current market home loan rates of near 6 percent, and you see why I'm happy. Prior to the flood, I had a loan of 5.125 percent. There's still a lot of paperwork to be done, estimates and building permits and we-can-only-imagine setbacks and slowdowns to come, but if we are able to finance the entire new house at that rate, we're going to be A.O.K. On another note, I found this photo of what New Orleans is going to look like in the immediate future. Yes, travel trailers will be everywhere, but the wiser pioneers will make sure to raise their wheeled wigwams to stay safe from any future flooding this hurricane season. A long climb to get home, yes, but then I'll be able to leave for work like the guy in that automobile commercial--with a parachute! The election for New Orleans Mayor is less than two weeks away. With all we've been through these past months since Hurricane Katrina, I can tell you that I'm looking for a new vision for our grand city. I'm looking for someone who can inspire us to do the impossible. I'm looking for a mayor who won't make embarrassing statements to the press, or to anyone else for that matter. I'm looking for a mayor who commands respect and admiration and will be an ambassador to the world. 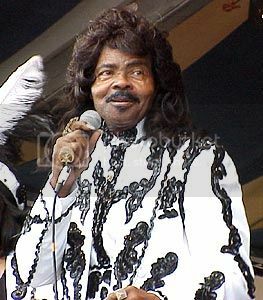 There are more than two dozen people seeking the job this year, but the only one who comes close to filling my criteria is none other than the Emperor of the Universe himself: Ernie K-Doe. K-Doe you may recall recorded one of the greatest songs in rock'n'roll history, "Mother-in-Law." The Allen Toussaint-penned tale of woe hit No. 1 on the Billboard Hot 100 chart in May of 1961, and also reigned on top of the R&B chart for 5 consecutive weeks. An R&B artist for mayor? Think about it: K-Doe has name recognition. He's got fans from every economic group, every ethnic background, and every religious persuasion. If it were not for the fact that K-Doe died five years ago, he'd be a shoo-in. Heck, if you think about it, that's probably not gonna stop him! His widow, the ever-flamboyant Miss Antoinette, does her level best to keep the memory and unbridled spirit of K-Doe's life alive and kicking. She announced her departed husband's bid for the city's top spot at a rally here the other day. I used to listen to K-Doe when he deejayed on WWOZ radio here. K-Doe was often drunk, or at least he sure sounded like he was. He had the habit of cutting in on songs to comment on the lyrics, ad-lib new lyrics, or just to shout out a hello to friends and neighbors. His favorite topic was, naturally, his own greatness, and he would encourage himself all the way, shouting out "Burn, K-Doe, Burn!" With K-Doe as mayor, New Orleanians will know that nothing is impossible, that no goal is too high, that if even death can't stop K-Doe, shaking off a bitchy hurricane can be as easy as twisting the cap off a bottle of bourbon. Now I know many will think this is a crazy idea. They will say, "A dead singer for mayor? That dog won't hunt." Okay then, how about this one, running for the City Council? The cell phone buzzed excitedly, and I fumbled with it as I pulled it from my pocket and flipped it open. "This is Tony from FEMA," the distant voice said. "Can you meet me at your site to arrange for your travel trailer?" Absolutely. Any day, any time, I told him. "Can you be there at 3:30?" Sure, I said, as I glanced at the clock and realized that was just 35 minutes from now. Difficult, but doable. In post-K New Orleans, FEMA is the new E.F. Hutton. You don't put these guys on hold. You don't ever ask to reschedule. You have to be ready when they're ready. And then Tony asked the question I most dreaded. "Do you know where your sewer cleanout is located?" Oops. I was not ready. I've blogged about the importance of this one little piece of pipe before. And I knew that one day I too would need to find this elusive Holy Grail of utilities. But I had not done it yet. I had not even started to search for it. A neighbor down the street had recently turned his flat front yard into a diorama of WWI France. It had taken Reggie days to locate that all important cleanout. I started sweating just thinking about it. I spoke with dread. "No, I don't know where my sewer cleanout is." Tony did not seem as concerned as I was. "Write this number down." He rattled off the phone number to the New Orleans Sewerage & Water Board. He told me to call and ask for the location of the cleanout. He said if I could get that info from the city, and if I could locate it on site right away, then there would be no delay. I was dizzy with the impossibility of it all. First, get useful info from a city agency over the telephone. Second, travel across town to make an appointment. Third, find the buried treasure based on coordinates provided by a city agency. I thought, I have a better chance of being elected Pope. But this was no time for negativity. When the unthinkable happens, you learn that all limits are artificial. "See you there," I said confidently. I called my Darling Wife and told her I'd pick her up on the way to the house. "I'll be waiting for you outside," she said. Gotta love her spirit! Since October, my Darling Wife and our Precious Daughter have been living in a nice, two-bedroom apartment in Riverbend. Comfortable and safe, it's on the second floor in a neighborhood that didn't even get water in the street, much less in any of the houses. We are quite simply as high and as safely dry as anyone in this fair city could be at this point in time. And we're paying dearly for it--I don't care to admit just how much. Let's just say that the FEMA rental assistance is not even covering half of it, and it's not exactly Park Avenue here. That's why we're eager to get into a travel trailer. That's why we long to squeeze two adults, one child, two cats, and what's left of our belongings into a space about as big as your typical living room. I picked her up and I keyed the cell phone for the New Orleans Sewerage & Water Board. I was pleasantly surprised when the phone was answered on the second ring. "I need to get the location of my sewer cleanout!" I'm sure I must have sounded desperate, more like someone calling 9-11 than the local water board. "Okay, what's the address?" a friendly voice responded. Surely this was not really happening. Was I not going to be transferred five times? Was I not going to be told that Mr. Slothington, who is the only person in the entire bureaucracy who has permission to access the information I needed, was on an extended lunch break? Was I not going to be told that personal and sensitive information, such as the location of someone's sewer cleanout, could not be given out on the phone in post-9/11 America, and that I would have to go down there in person and spend the better part of a day waiting in line so that I could be told that I would need to come back tomorrow and stand in another line???? After holding less than a minute, the friendly voice returned with measurements. "It's five feet from your front property line and 27 feet from the dividing property line on the north side." I repeated the coordinates out loud and asked my Darling Wife to jot it down. I thanked the lady profusely. "Who knew this would be so easy?" I said. "We do this all the time," she said. Amazed, I blubbered my gratitude and told her I would never speak ill of the Sewerage & Water Board again. Some minutes later, we found a pick-up truck parked in front of our water-stained, brick veneer house. "Did you get the location of the cleanout?" Tony immediately asked, getting right to business. I produced the information, and Tony produced a tape measure. We started digging. Two out of three, I mused to myself. We got the information from the city, and we made it back to the house on time. Can luck like this continue? After turning several shovels of dirt, Tony told me to stop. "I don't think this is the right location." Anger, disappointment and shame swept over me in quick succession. My Darling Wife and Precious Daughter were depending on me to find the cleanout, to meet FEMA requirements, to allow Tony to complete the paper work, to get us a travel trailer, to live on-site while we rebuild our house and our lives. It all came down to me and a garden shovel, and I was about to fail. Tony went back to the truck and pulled out the tool that would save the day: a metal detector. It had a tubular body and a black box of electronics mounted on top with a couple knobs and switches. Tony quickly turned the tuning knob and with a gentle sweeping motion as one would use a scythe, he began to scan our front lawn. The metal detector squealed and squawked in ways totally incomprehensible to me, but that seemed meaningful to him. Tony moved back and forth near the hole I had just dug, and then stopped. He kicked at the weeds growing there and scanned the spot with the metal detector again. Then he dug a divot in the dirt with his boot heel just one foot away from the first hole. "Dig here," he said. I put the spade to work, and after digging for a few minutes, I hit a solid metal object. "I think that's it," I said. "That's it," said Tony with the confidence of one who has done this a hundred times before. Soon, we were looking at the cap of the elusive sewer cleanout, and I admit to feeling a bit like Indiana Jones at the pride and wonder I felt in discovering it. 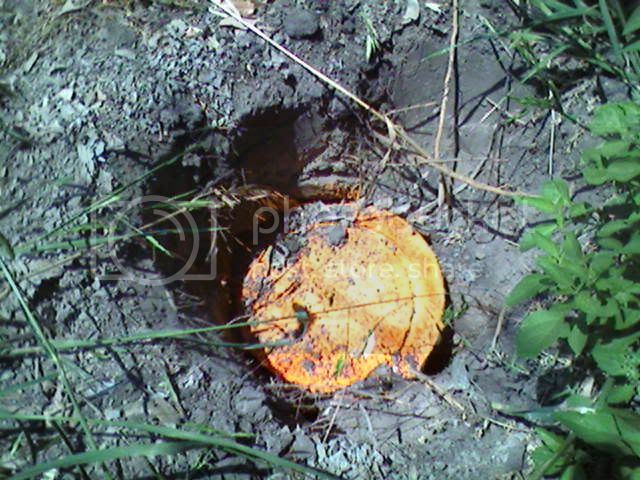 Its metal cover was imprinted with the same moon and stars motif that we commonly see on water meters here. It was rusty, dirty, and perhaps the most beautiful thing I had seen in my yard since Hurricane Katrina. Tony, of course, was not as emotional and proceeded to spray it with fluorescent orange paint. We signed some forms to give FEMA permission to install a travel trailer on our property, and we were on our way in short order. No estimate on when, but soon, we were told, soon FEMA will deliver a trailer. And I learned once again that stereotypes are almost always wrong. I had called a city agency and received prompt, courteous, and very nearly accurate information. I had been helped by a FEMA employee who knew exactly what to do, how to do it, and was about as helpful as I could ever have hoped. Before we left, I told Tony that I was going to have to change my tune about FEMA since he had done such a good job and had been so helpful. "I'm from here, too," he said. "I'm just doing what I can to help people." In February, we were still getting Christmas cards. In March, we started to get magazines. And in April, I'm actually seeing mail with postmarks less than a week old. The US Postal Service took a beating in Hurricane Katrina just like the rest of us in New Orleans. And like us, they've struggled to get back to that elusive place we call "normal." A recent story in The Times-Picayune heralds the reopening of the local mail processing center. Count this as an important mile marker on the road to recovery. For months, we had to go to a central station to pick up the mail. I blogged about that experience in November of last year. Back then, we were finding mail in the box at our apartment in the "sliver by the river" perhaps once a week. In January, it may have been two or more times a week. By mid February, we started seeing mail on a daily basis. Old mail--typically out-of-date bills and special offers--but regular mail delivery nonetheless. About a month ago, my wife received the special holiday issue of Family Fun magazine. The cover alerted us to the great holiday gift ideas inside. Better late than never, as they say, but what was important for us was that it signaled the return of magazines. Soon after that, I received the November, December and January issues of one of my magazines all in one week. The only thing we don't have at this point is junk mail. And I confess, I miss that, too. I liked that there were people who wanted me to have 10 DVDs for a penny. I liked knowing that Quality Paperback Book Club wanted me to have 6 books for a dollar, with no long-term obligation. And I'm worried that Publishers Clearinghouse may be trying to find me with a guaranteed winning number, but my future fortune is going unclaimed because the Post Office has a petty grudge against Bulk Rate mail. In the ghost town of Vista Park, the neighborhood where we used to live, the Post Office has told us that house-to-house delivery will not return for a while. As people return to live in travel trailers or a few in actual houses, USPS is setting up community mail boxes in every block. This is a temporary situation, we are told, but many of my neighbors take a more cynical view. They know that newer subdivisions everywhere in the country either have community boxes like these, or they have mailboxes at the curb. Letter Carriers who walk a route are going the way of newspaper boys on bicycles and milkmen leaving bottles on the doorstep. Progress can be good or bad, it seems. But in New Orleans, I find all progress encouraging. Nature does not care. If we learn nothing else from the destruction Katrina delivered upon New Orleans and South Louisiana, it must be this. Up until a few months ago, New Orleans was teeming with biological activities of many kinds. Humans, of course, were the dominant influence on the landscape. But there were plenty of trees in this urban forest. Gardens and lawns, domestic animals and wild squirrels and birds as well. When the water was finally pumped away, the landscape revealed was drastically changed. But as the expression goes, “Nature abhors a vacuum.” Where humans once reigned, mold and fungus moved right on in our domestic castles. Where carefully planned gardens and tidy lawns once covered the land, a chaotic quilt of wildflowers and weeds blankets over all. Life, once removed and destroyed, has returned. Nature does not care. To her, the world is just one big snow-globe of life. Every now and then, she shakes it violently just for the heck of it. There’s a good reason the moral way of treating animals is known as “humane.” Left to the ways of nature, there is tremendous suffering in the animal kingdom. We humans, and perhaps some few other species, actually care. 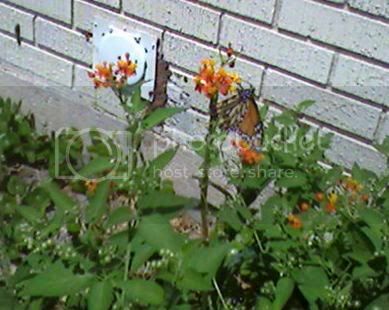 Before I drive off every reader with these philosophical musings, let me get to the point of this blog: I was at my fatally damaged house today admiring the butterflies. My Darling Wife had always made sure we had plenty of milkweed in our garden. It’s the food of choice for Monarchs, she taught me. Well, since Katrina, the milkweed has been growing like, well, weeds. And the Monarchs are taking full advantage of it. Fat little caterpillars are abundant. When they’ve gorged their chubby black and yellow striped bodies to the point of bursting, they climb to some convenient place and hang to become chrysalides. I was at the house today, and I counted 10 of the little green sacks with gold buttons. The lawn and the garden are overgrown and out of control. The house is ransacked by floodwater. But nature does not care. 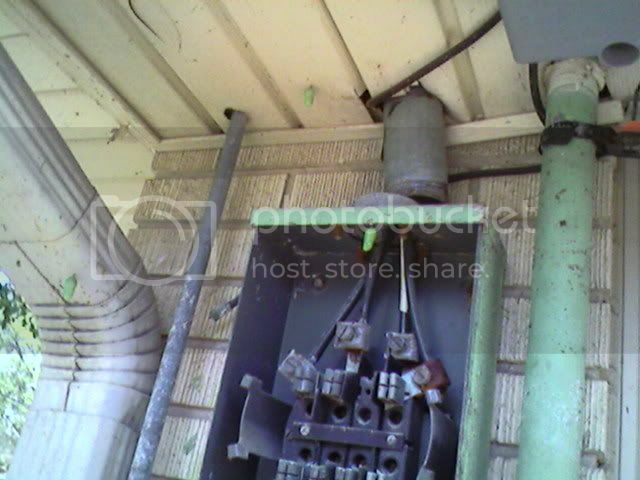 The electrical meter was removed weeks ago by the power company, sad evidence of how life here has changed. But to a butterfly-to-be, it’s just another place to closet up for the metamorphosis. We, too, are working through the changes in our lives. Many of us are hanging in the “J” position right now, waiting to emerge from the pupa stage, hoping for the best. We know that nature is not on our side—nature is on no one’s side because she’s perfectly indifferent. It’s up to us to make this happen. It’s going to be up to us to make it work. We have to care. Fellow blogger Seymour D. Fair has posted the silver bullet that should kill the myth that New Orleans is too far below sea level to seriously consider saving after Hurricane Katrina. In the excellent post, If You Tell A Lie Big Enough And Keep Repeating It..., Seymour exposes the ignorance of elected officials and others who go around saying that New Orleans is more than 10 feet below sea level. Well, it ain't. So get your facts straight, Senator Bennett, or quit talking about things you know nothing about. I encourage everyone to share this valuable information widely. I lost a lot things in Hurricane Katrina. Our pre-K lives melted like the Wicked Witch of the West when the floodwater filled New Orleans. And even though it's been more than seven months, I still, on occasion, miss some of my stuff. Things like my albums. I'm talking 12-inch vinyl discs, lovingly stored in paper sleeves tucked into cardboard jackets. What we used to call "LPs" for long-playing records. I had a whole bunch of Beatles records, and lots of 70's and 80's pop. Sure, I know I can easily replace those Beatles records with newly burned CDs, but it's just not the same. Records were 12-inches in diameter, so the covers were big, too. A lot of them opened up so that you got plenty of photos, notes and lyrics. The tiny art and booklets they put in CDs just don't compare. And there were a lot of albums in my collection that simply cannot be replaced in the laser age. I had a copy of "N.O. Experience Necessary," a compilation of local new-wave and punk bands from the late 70's. You just can't buy anything by The Mechanics, The Driveways and The Backstabbers nowadays. I had a full set of Blondie, too. I could probably get "Parallel Lines" on disc, and I might even be able to get "Plastic Letters" and the debut "Blondie," but it would not be the same. And all my DEVO albums--gone. In a way, De-evolution finally caught up with the spudboys. I had some fun stuff, too. Like "The Story of Star Wars," which was a combination of the movie soundtrack and narration from "Episode IV: A New Hope." When I bought that album, we had no idea there would be sequels and prequels. Luckily, I played that one for my Precious Daughter a few months before the storm, so at least she got to hear it one time. Books are something else I miss. I'll never replace my high school year book. And I'll never replace my Army Basic Training photo book. Who will ever believe I fired an M-60 machine gun without those pictures to prove it? I had a few autographed books, too. Nobody really, really famous, but they were special to me anyway. For instance, I had a signed copy of Mel Leavitt's "History of New Orleans." I lost a lot of furniture in the flood, but it's not the same. We had two almost new sofas in our house, and a fine dining table. These items alone were worth thousands of dollars more than my entire collection of books and record albums. But I just don't pine for my furniture. I don't find myself wistfully thinking, "Man, I'll never sleep in that bed ever again." I don't long to sit in the big blue chair and put my feet up on the ottoman. I guess those things can all be easily replaced. I should not complain, though. We all got out alive, healthy and untraumatized. And as I wrote a while back, I was able to salvage some of my CD collection, even if they are somewhat smelly. But that was just part of my music collection. I have virtually nothing pre-1988 when I joined the digital music revolution. I can't help it--I miss my albums. It makes me sad to know that I will probably never again drop a needle into the groove of "Serfin' USA" by Bas Clas, or rock to the frenzied energy of The Angry Samoans. One record I did not have, and I'll be glad if I never hear again, is anything by Katrina and the Waves. I bet you can guess why! Hey, I was in The Times-Picayne today! I've seen more than one blogger in the paper since Katrina. Let's hope it continues.